I’ve never been a good swimmer. I could swim, but as the old joke goes it was more like not drowning than swimming, and I never really enjoyed being in the water. As Steph and I gallivanted around the Philippines we talked about my fear of water and tried to work on my swimming skills. Eventually, after much time chasing waves on Sugar Beach, I was able to get to a point where I could comfortably float and tread water for longer than 3 seconds. We determined that I am almost certainly slightly negatively buoyant (if I hold a full breath and don’t move I tend to settle with only my eyes above water) but with a little effort I can float in a reasonably natural way. Based on my newfound confidence in the water, I decided that I was ready to try diving, a choice that I know thrilled Steph to no end. She had been pining away for years wanting to join her fishy friends under the waves, and her unbridled enthusiasm for snorkeling was just a taste of how much she wanted to try diving. That said, she was very good about letting me move at my own pace. She had spent enough time helping me overcome my paralyzing lack of confidence in the water to understand that I had to feel really ready, that my primal fear of drowning wasn’t something I could easily push through. With my reassurance that I was feeling as ready as I ever would, Steph made arrangements for us to dive with a small shop on an island off the south coast of Negros near Dumaguete. She had been diligently researching scuba options in the Philippines pretty much from the moment we arrived, and, well, she tells it better than I ever will, but in any case she found an unlikely but promising operator through an unrepeatable series of coincidental internet searches. 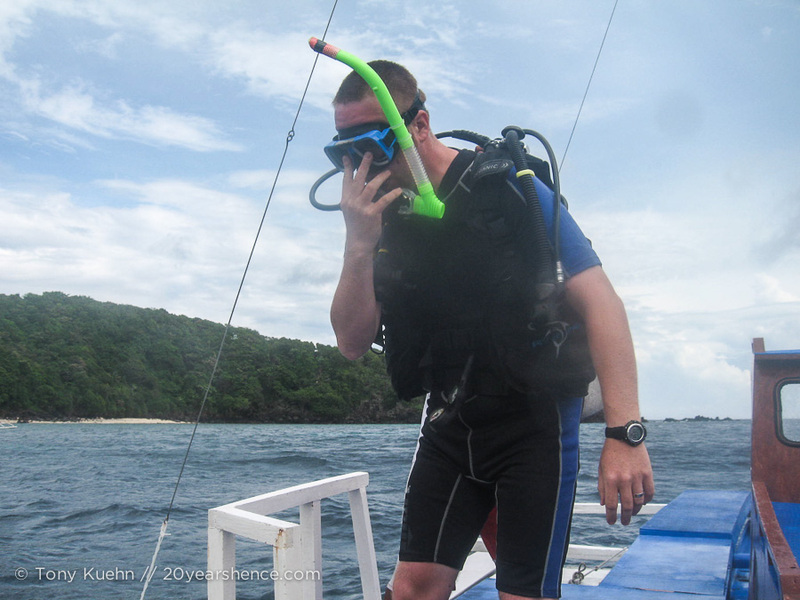 He had over 8000 dives, 95% of which were around the island he’s based on and everything about the information we read felt right, so we took a chance and booked our lessons. When we met our instructor Mario and his wife Mila for the first time he was captaining the boat that would transfer us out to the island where we would spend the next five days learning to dive. The boat was a simple 25-foot long mono hull affair with two outriggers (colloquially known as a “pumpboat”) similar to what you see everywhere in the Philippines. But, it had a few notable exceptions: this boat was far nicer than most, with a proper cabin and a wider, more stable construction. And best of all, it also had two masts, clearly rigged for sails. Mario’s boat, moored off yet another beautiful piece of the Philippines. As we drifted away from shore, Mario asked us if it was okay if we sailed to the island, as sailing would take a little longer than using the engine. It seemed like a rhetorical question to us, but we answered with a hearty yes! Most pumpboats have a small four-cylinder engine with no muffler that sits in the back and powers the propeller; they are normally tremendously loud, so the prospect of a quiet journey to the island was very welcome. Looks a little Jurassic Park-ish, no? 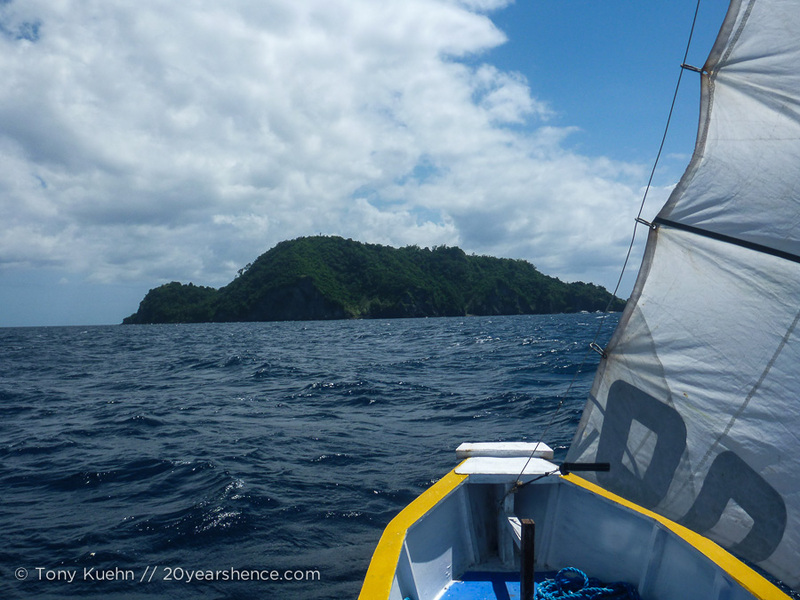 As we sailed towards the island, Mario told us that when he was in high school he had to build a small boat to take him to Dumaguete in order to go to class, since there were no pumpboats then and no high school on the island. 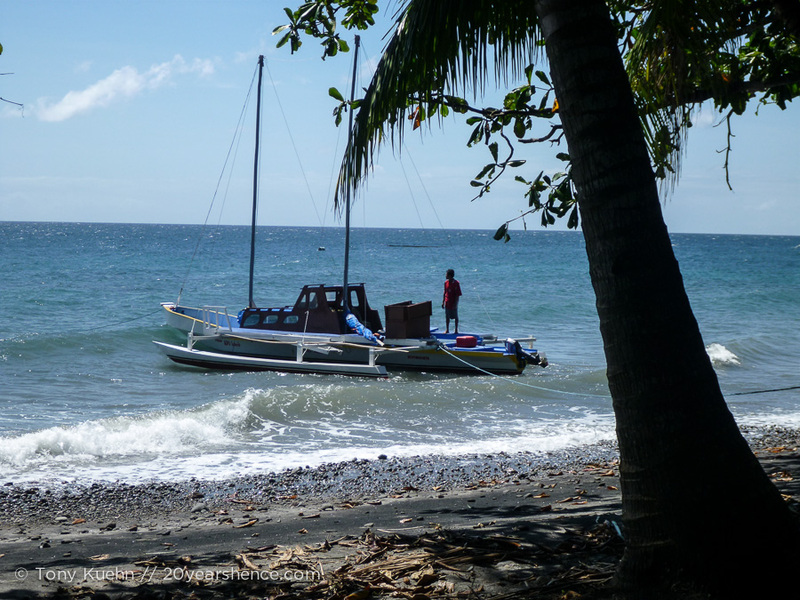 Later, as he was getting into the diving business, he built his own pumpboat and eventually sailed it to Mindanao (check a map, it’s not a short journey) in order to bring back the wood he used to build the boat we were currently on. By this time we were approaching the island, so our conversation gave way to admiring the view and the mechanics of not running the boat aground. Later than night, we shared dinner with Mario and Mila and got to know each other a little better. We found out that Mario had been chief of the village for 10 years, and runs a program that works with local kids to teach them how to preserve the reefs and island ecosystem, where they learn about recycling and conservancy that will make them responsible stewards once they are older and promises a better future for Mario’s part of the world. In addition to this, Mario told us that the island’s economy was once based on fishing, and over-fishing and harmful fishing methods (cyanide and dynamite) lead to a nearly ruined reef and dangerously low levels of fish. Over the last 10 years Mario worked with the local fishermen, teaching them how to fish responsibly and maintain a healthy balance between reef life and their own needs. 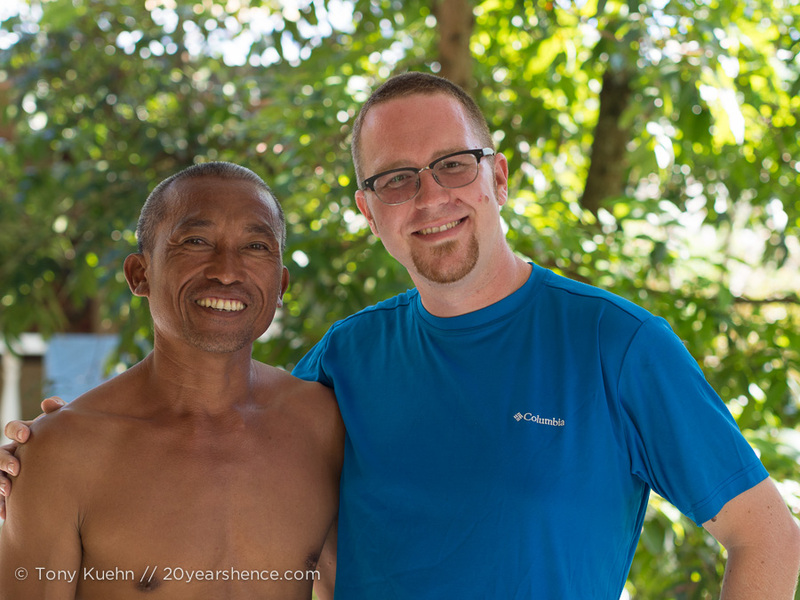 His work has been so successful that he was invited to charter a similar program in Indonesia. His positive influence on this place was clear, and as we sat around his dinner table, listening to the geckos belt their munchkin-pitched “huh-errrgh” through the humid dusk, we felt fortunate to know such a man as him. The next morning was it: the Big Day. Despite getting only a few hours sleep, I was wired. My newfound confidence in the water had inspired me to take this leap, but I really had no idea what diving would mean once I dropped below the waves. All I knew was that I was facing one of the biggest sources of anxiety I have head on and it was making my heart race. 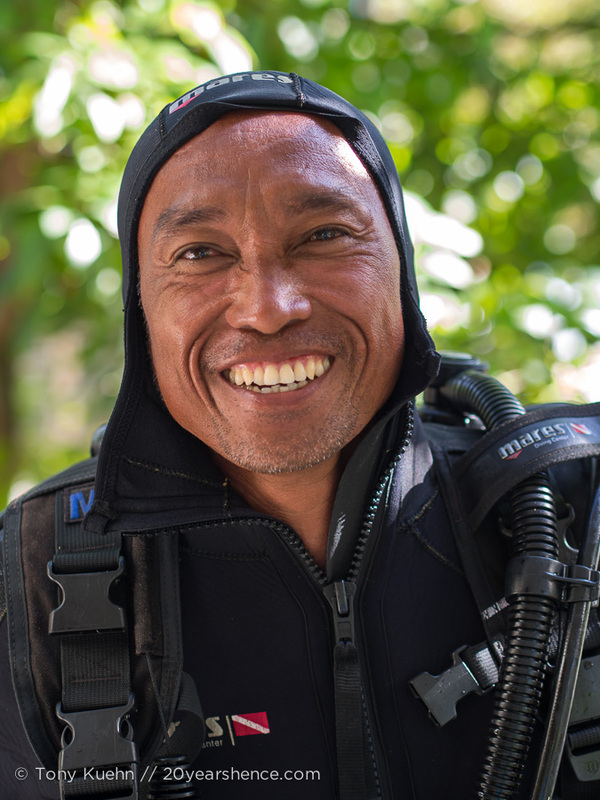 Mario walked us through the basics of diving with his unflappable calm and it became clear to me that all I had to do was keep breathing, something which should occur naturally. I trusted Mario—trusted him to give us the right instruction and reliable equipment—so I decided to do my best to just let go and see what happened. My respect for Mario as a person and an instructor gave me that little push of confidence I needed to get into the water. We walked out over some rocks and stepped into a little dell of sandy-bottomed water about four feet deep. We put our flippers on, slipped our masks over our eyes and slowly kneeled down together, Steph, Mario, our divemaster MackMack, and I. As the water rose over my mouth and eyes and my knees sank into the soft, sandy bottom my breathing became ragged. My breaths came in great gusts and I exhaled in bursts that matched the incredible thumping of my heart. The lizard part of my brain was in overdrive, convinced that I would die at any moment, that my next breath would be water, not air. I looked at Mario who, watching us like a patient father, reminded us to breathe slowly, in and out and just take time to adjust. Gradually my nerves calmed, my primitive brain realized it was still alive and I was able to look around. Breaths came easily and suddenly I was able to fully trust the equipment. It dawned on me that scuba gear is fairly simple, and even the most serious failure is covered by myriad failsafes. I would be fine. After Steph and I got our bearings Mario walked us through the beginning exercises and I was elated to find I was able to do everything with a minimum of fuss. Taking the regulator out of my mouth, finding my regulator when it’s loose, clearing my mask, all done with no trouble and followed by a firm handshake from Mario marking my success. After our introduction to these techniques we changed our tanks and Mario guided us out into deeper water to take a brief tour around the house reef before heading back to shore. I struggled mightily with my buoyancy through the beginning of the tour, alternately dropping like a stone and popping up like a rocket, never quite finding the finesse I needed to neither rise nor fall. MackMack made sure I didn’t skewer myself on the corals or disappear into space as he slowly guided me around the most beautiful place I’d ever seen. 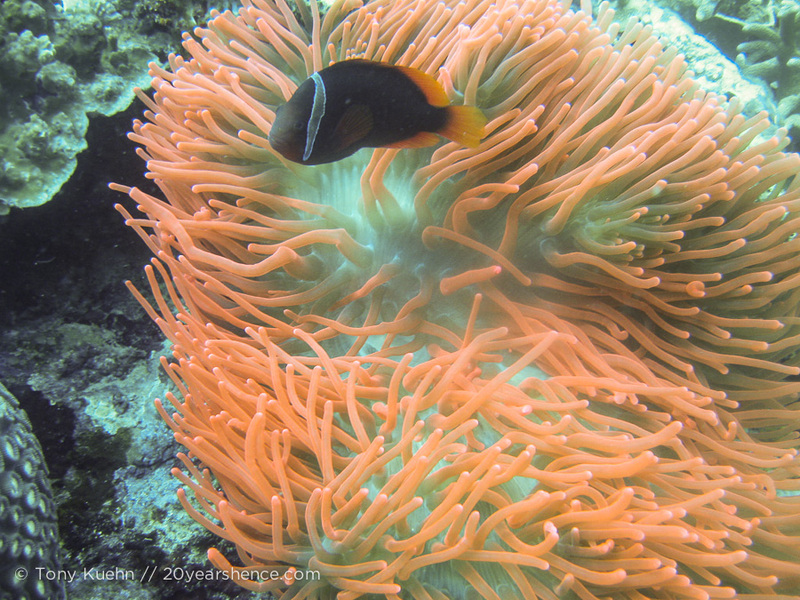 Fish darted everywhere, bright corals clung to every surface and every direction I looked there was something new. Here a nudibranch, there a sea-snake, over there a puffer fish, below a lion fish and above a trumpet fish. Schools of Moorish Idols and flocks of butterfly fish filled my vision. Needlefish, angelfish, anemonefish and untold others all appeared and disappeared, going about their lives. In 15 minutes of diving I had seen more diversity than I could have imagined ever existed. Steph and I had done our share of snorkeling, but it was poor preparation for diving. Now as we glided through the water the fish were unafraid, and often swam within inches of us. The underwater universe spread out in front of me and in a flash I knew that as much as I could spend years paddling around the tiny house reef here and never see the same thing twice, there was also the vastness of all the oceans, waiting for me like a pearl. I had initially been terrified at the thought of going down to eight meters so soon (my first dive!) because, for someone who is woefully under confident in the water, eight meters seems very deep. But as our first dive progressed, I was concentrating so much on my buoyancy, looking at all the fish, and the general mechanics of diving, that by the time we made it to our final depth I was too busy to be scared. I had a moment where I looked up through all the water, and just thought ‘huh, that’s something, I’m almost 30 feet down!’ I was shocked by how easily I was able to take it all in. When our first dive was over, I stepped out of the water and turned to Steph. I knew prior to the dive her anxiety had been high: her expectations had been impossibly high and I hoped desperately that the dive had lived up to what she dreamed it would. However, she was clearly more worried that I hadn’t enjoyed myself, and I quickly told her that this was the coolest thing I had ever done. All I wanted to do was dive, as much as possible and everywhere we could. She reassured me that she had loved it too and we said we were both ready to get back in the water as soon as possible. My first dive was a huge success for me; it went better than I ever imagined it could, and I feel like I took to it far more naturally than I could have guessed. Of course, there were still moments of anxiety and unexpected situations in the water can sometimes still spook me, but overall I never dreamed I would love it as much as I do. Ultimately, I have Steph to thank for this. We are always talking about what good complements we are for each other, how we make up for one another’s weak areas, and diving is yet more proof of that. On my own I don’t think I would ever have gone diving, in fact, I’m certain it would never have occurred to me. Without Steph nudging me in a new direction I never would have known what I was missing. Her support, and willingness to help me grow has made me a better, happier person, and there is no clearer example of this than my newfound love of diving. This first dive changed my life. In 45 minutes I saw the world in a way that I had previously lacked the imagination to even conceive. The perspective shift was profound and all I could think was that we were going to spend the rest of our lives exploring the world but even still, we will see only a fraction of what exists. The notion that we could ever “see the world” suddenly seemed absurd as I considered the vast amount of life contained just in the small space around this one island. But I also realized that, while we may only see a little bit of this planet, what we will get to see will be so much more diverse and exciting than we could have ever imagined it would be. I had to do everything I could to experience as much of the world as possible and I would start making up for lost time beneath the water as soon as I could. Humans have explored a tiny fraction of the oceans, of which the Earth is mostly comprised, and the diversity we’ve already found is staggering. To be face to face with the incomprehensible variety and amount of life under the waves is to begin to understand an infinite universe. Diving made me feel very small, and very fortunate. It’s hard to understand how big the world is until you go and see it, and on that dive I really began to understand that there is enough to see underwater to fill a thousand lifetimes. I love that you overcame your fear Tony. I’m not a bad swimmer and don’t have a real fear of water but I do have a healthy fear of diving. I am eternally worried that if something were to go wrong that it is impossible to breathe down there! Your story is an inspiration though and I am hopeful I can one day follow in your footsteps. Congratulations! Thanks! I was worried about something going wrong too at first, but honestly the equipment is designed so that even if it fails completely it still works to some extent. For example, if your respirator fails, 99.9% of the time it will fail by letting air free flow, not by stopping air. Also, if you do run out of air completely, you can still surface as long as you aren’t really deep, because the air expands as you rise, giving you a little more air in your tank and your lungs… I know this, because it happened to me and I was fine! Sounds scarier than it was, oddly. Tony, your experiences of your first dive amaze me and make me feel fortunate that I can come here and vicariously live something that I am terrified of as well. It sounds like you picked the perfect instructor, and that you and Steph had the time of your lives under the waves. I also love how clearly you love Steph and give her credit for taking this huge step. I am going to have to think about this. I might one day do the very same thing, and have you guys to thank. Keep on having a blast, I am reading, and will be excited to see what your next stop will be. So glad to hear we may have inspired you! That’s why we have this blog! I hope you do try one day, it really is the best! You two are such a great couple! I love this whole story. Thanks! It’s nice always getting to do this stuff with my best friend! No kidding! It’s amazing that everyone isn’t diving, but I can certainly understand how all kinds of nerves would keep them out of the water. All I can say is that it’s so worth it! So awesome that you faced your fear and went for it. Diving is so addictive, and it’s an amazing way to experience the world. So true, there really is nothing like it! Thanks! As they say, can’t have courage without fear, and I’m glad I was able to overcome some of my fears. Will do our best to stay out of traffic, but we’re in Vietnam now and traffic is a way of life here! Well done for overcoming your fears – I’m glad you had such an amazing experience. Both you and Steph have inspired me to give diving a go; who knows, maybe we’ll even look Mario up when we’re in the Philippines! You should, he’s the best! 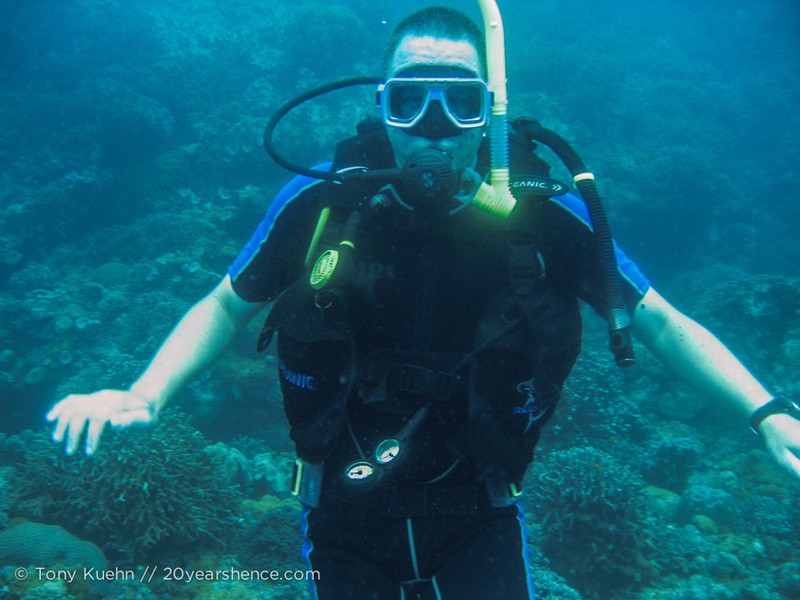 I hope you enjoy diving, it can seem overwhelming, but if you give yourself the chance, it’s so rewarding!